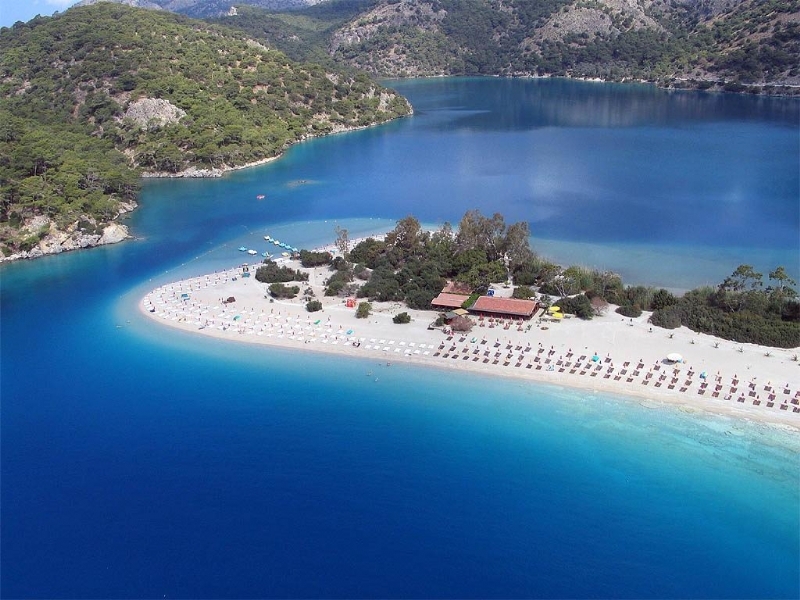 Fethiye is in the Mediterranean region with its population of 180,000 and 3,059 sq km area. It is the biggest district of Mugla. It is a sea-side town that is established at the slope of mountains. It became one of the most important tourism centers of Turkey with its marina, ancient villages and structures, sea, natural beaches, shopping malls, bars and night-life and transportation. Esen and Fethiye plains are the gifts of nature to the town with its 167 km length coast, 180 gulf and bays, 18 islands, mountains and rivers. 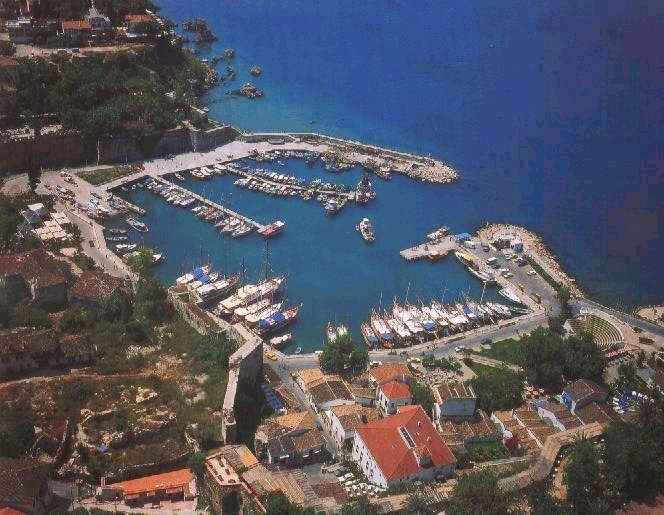 In addition Fethiye has 12 towns (Çamköy, Çiftlik, Esen, Göcek, Kadiköy, Karaçulha, Karadere, Kemer, Kumluova, Ölüdeniz, Seki, Yesilüzümlü) and 73 villages that are in borders of these towns. It is thought to be founded in 3000 B.C. This ancient city was founded on the Caria border of Telmesos Lycia. This city is devoted to Apollo and it is understood that this city has a rich culture in Roman and Helenistic period thanks to the structures that survived till today. Persians dominated the city in 6th century B.C. then it entered the Delos Community in 5th century B.C. and also it went under sovereignty of Lycian in 362 B.C. Respectively, Mausolus king of Caria, Iskender (Alexander) in 333 B.C., the Seleucids, Lagos Dynasty in Egypt in 3 B.C., Pergamon (Bergama) Kingdom in 188 B.C. and then Romans and Byzantines ruled the city. In 1284 it was under the management of Menteseogullari and then after 140 years in 1424 Ottomans took the management of the city. 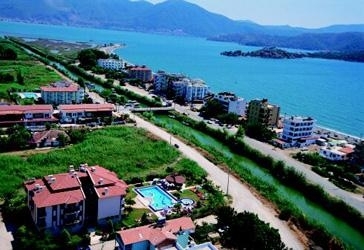 The name Fethiye was given the city because of a memory of a plane crash that resulted the death of Fethi Bey. 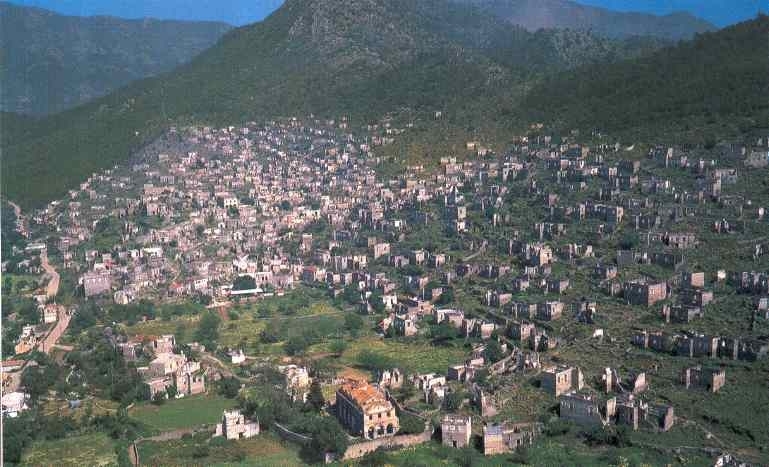 In the late 18th century Fethiye was a town of Aydin was under the invasion of Italians from 1919 to 1920. After the War of Independence with the leadership of Atatürk, Turkish troops won a victory and Fethiye has been a Turkish city in Republic of Turkey till today. 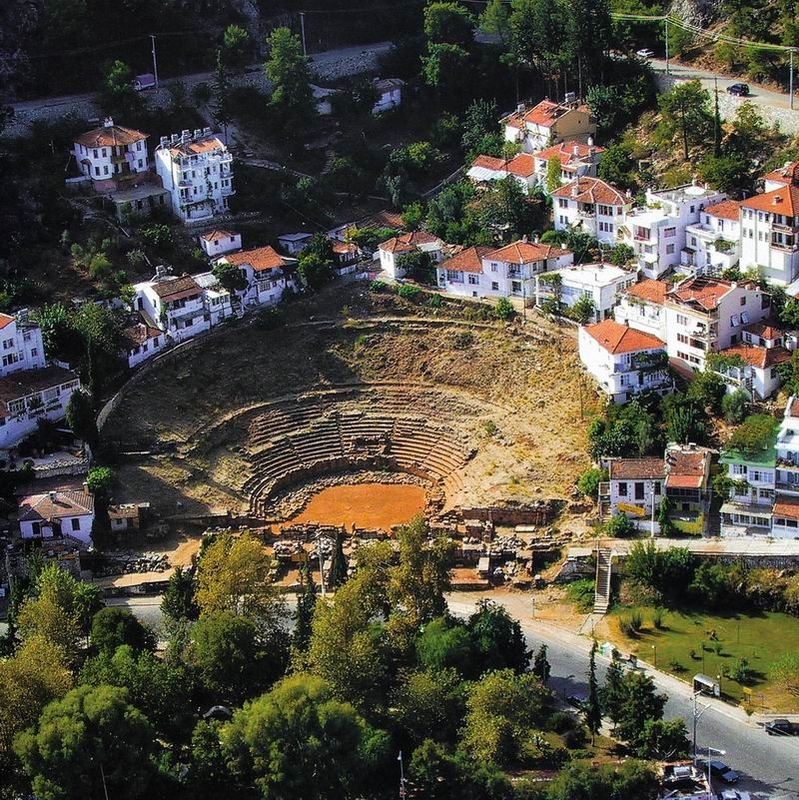 Telmessos Ancient Theatre: This theatre is the closest theatre to the sea in Turkey. It is located just behind the marina in city center. The theater seats were found during excavations in 1993. Ongoing studies ended in 1995, and all the remains were recovered. It is known that the theatre which is established in 2nd century in Early Roman Period has a capacity of 5000 people. Project works has been completed for the repair of Telmesos which can accommodate 1500 people today. 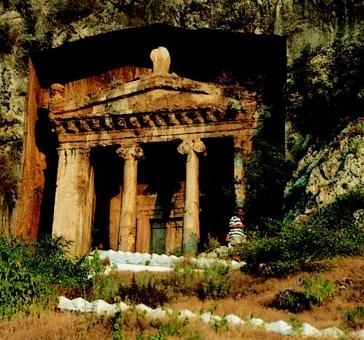 Telmessos Rock Tombs: It is one of the most important legacies in Fethiye. It is estimated that they are built during the Lycian period in 4th century B.C. 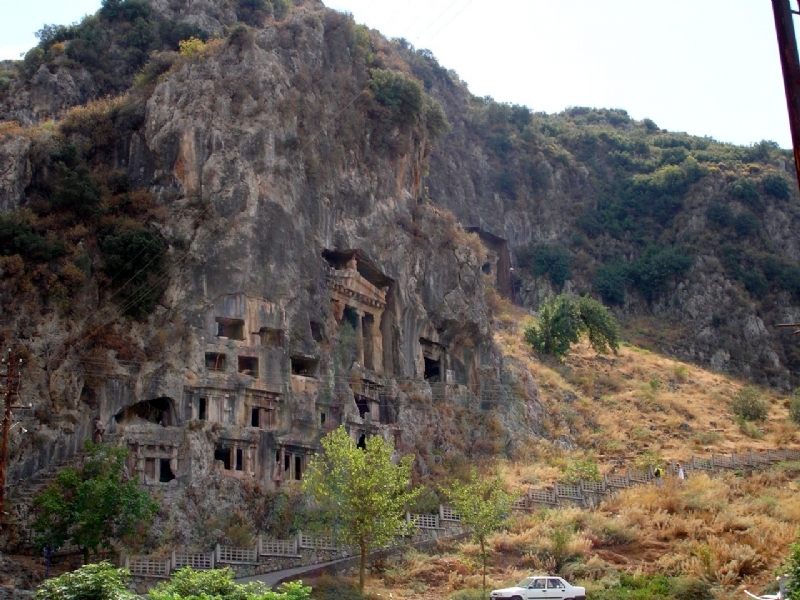 Rock tombs are on the eastern slope of the hill and they are close to the city center. There are Corinth titles at the both sides. There is a tomb inside which was designed as a family tomb. Cadianda: It is 18 km far from the city center. It is estimated that Cadianda was established in the 5th century B.C. After the excavations made by Fethiye Museum, theatre, agora, stadium, public bath, tomb, temples and memorial tombs have emerged. 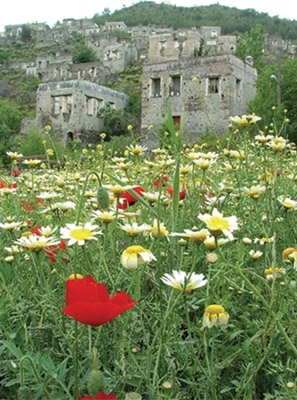 Recent years, the region became the focus of attention of the visitors. Kaya Village: Important tourism center Kaya Village is 8 km far from the city center. The village was established in early 19th century and Turks and Greeks lived together in this place. There small churches and ancient tombs ruins that were abondoned by Greeks. Ölüdeniz – Belcekiz Beach: Ölüdeniz is 128 km far from Mugla and 12 from Fethiye and it is established at the slope of Babadag at 1975 m high. Belcekiz beach is one of the most important beaches in Turkey which have been selected as the most beautiful beach in the world in 2006. 950 hectares of area protected as Kidrak natural park in Ölüdeniz. Ölüdeniz Babadag attracts tourists attention all around the world with its paragliding activities. Saklikent: Saklikent (Hidden City) is the longest canyon in Turkey with its length of 15 km. Is is about 32 km away from city center. A shepherd discovered the canyon before 14 years which has been occurred as a result of a crash 200 thousand years ago. Its water that is quite severe and cold, comes from Bey Mountains. 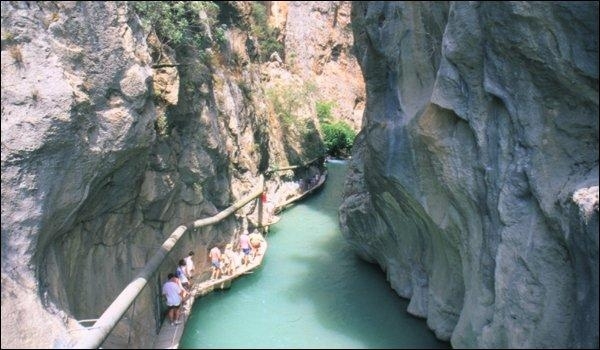 Because of the strong flow in canyon, visitors can reach the canyon over wooden platforms on foot. Yaka Village: It is 35 km away from Fethiye and it is mostly known as its old name Tlos. There are ancient castle, ancient theater, ancient ruins and ancient tombs in Tlos. Thousands of local and foreign tourists visit this place. Xanthos (Ksantos): This city is 46 km far from Fethiye in Kinik village. It is said to belong to 4th century. It was the religion center of Lycian region. Xanthos is surrounded by walls and it consists of two acropolis. There are Ancient Roman theater, Harpy monument, Lycian sarcophagus mausoleum, agora, monumental inscriptions and rock tombs in the ancient region. Butterfly Valley: It is a quite valley which is 3-4 miles far from Fethiye and surrounded by 350 m high mountains. The waterfall which flows in summer, large sandy beach, sparkling sea and charming nature are the stations which bay travelers can not forget. Göçek: It is one of the most important place of yatch tourism which is 30 km far away from city. It is famous for being the natural port, pine hills, the nearby ancient ruins, bays and islands. Every year, hundreds of yachts stay here. Car rental Fethiye,rent a car Fethiye ,Minibus rental Fethiye,rental Jeep is nesessary for arrive all historical place that around of Fethiye. Sport Activities: paragliding, water sports, mountain sports, boat tours, Safaris,Trekking, diving, jeep safaris, horseback riding, soccer and highland tours are among sport activities in the city. Local Food: Fethiye’s special Legen Böregi, keskek, raw pie, sündürme, et kapama, arapasi, döndürme and yumurta bohçasi are some of the local food of Fethiye. Accommodation: Holiday tourism is developed in the city, thanks to this, there are many hostels, resorts, apartments, hotels, motels and tent camps. Highway: Ankara is 650 km away, Izmir 320 km, Istanbul 820 km, Aydin 220 km, Antalya 150 km and Denizli 180 km away from Fethiye. Airport: The closest airports are 50 km far Dalaman Airport and 255 km far Bodrum Airport. Transfer service: Airport Dalaman to Oludeniz ,transfer Dalyan,Transfer Gocek,Transfer Lykia World Hotel ,transfer Fethiye,transfer Hillside Beach Club,transfer Calis,transfer Sarigerme,transfer Kalkan ,transfer Kas and Fethiye rent a car ,car rental Gocek,car rental Oludeniz,car rental,Calis,Car rental Kalkan,Car rental Kas is available 7/24 road service and call centre.